A study by 451 Research found half of Americans planning to buy a smartphone in the next 90 days want an iPhone. It's still an impressive figure for Apple, but it's down from 71 percent in September 2012, while Samsung went up from 13 percent to 21 percent. The survey also investigated the satisfaction rate of smartphone users based upon their mobile operating system and discovered that Apple's clients are most satisfied, with 71 percent of respondents saying they're very satisfied with their purchase. All other mobile operating systems score a lot worse in this ranking, Windows Phone ranks second with a satisfaction rating of 53 percent, and Android takes the third spot with 48 percent. 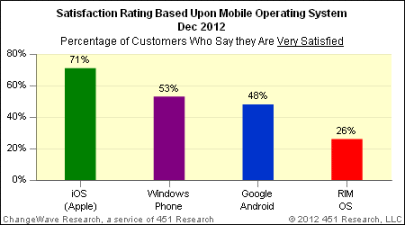 RIM's BlackBerry OS on the other hand achieves a satisfaction rate of only 26 percent.